The winds coming from the north are called “Etisiae” meaning annual winds, because they blow regularly every year and they are known as Meltemia. They have a northwest to northeast direction and are divided to forerunners and annuals. The forerunners blow from the end of May or early June until early July and don’t have great speed. They are very frequent and strong. They blow in August more frequently than every other month. The direction of meltemia is different from region to region. In the Ionian Sea and the coast of Western Greece the direction is northwestern. This is the wind which in Greece is called Maestros. In the northern Aegean they are ranging from northeast. But as they gradually come down, they become north, northwestern winds. But also the speed of the meltemia isn’t stable. It varies from hour to hour, even in the same place. Meltemia starts blowing in the morning and becomes increasingly stronger, reaching its higher speed at midday between one and three o’clock. Then it begins to fall and calms down at sunset. 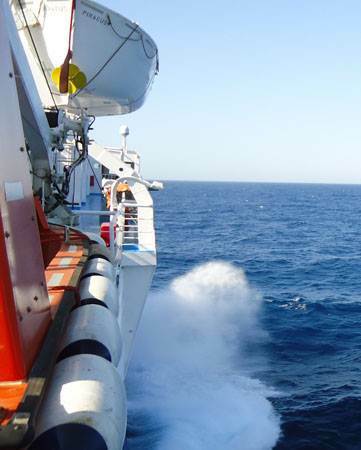 Meltemia blow with great force on the open sea. Their strength decreases as they approach the coast and the mainland. In the Aegean Sea, they are usually strong or violent winds, reaching to the extent of a storm. Because they are winds who live on the mainland, they are also relatively dry and as a result they grow the dryness that prevails during the summer in Greece. And because they are north winds they are cooler, resulting in reducing the high temperatures of the summer. Meltemia are not the only winds blowing during the whole summer. When they aren’t blowing, within the country there is no wind, meanwhile in the coastal areas and the larger islands, it blows the aura. The aura is also a summer wind, but it doesn’t blow in the same direction all around the clock. It is a light and always pleasant breeze. During the day it blows from the sea and it’s called sea aura-the ancient Greeks called it “ Tropaea”.And the night it blows from within the mainland, called apogee aura - “ Apogaea” is its ancient name. In the summer it is very common in the Greek coast to sometimes blow the meltemia and sometimes the aura. What is rare is not blowing at all. To have absolutely no wind. The aura is blowing during the whole year in the Greek coast, when the weather is fine. This is one of the key features of the Greek summer. The sea aura begins to blow at 10am and strengthens at two or three ,at noon. After that its speed is gradually reduced and stops completely when the sun sets. For about an hour or two, it’s not blowing at all. Then as the night comes the afternoon aura is starting to blow but at a slower speed.